The controversial Adani mine has brought India strongly into Australia’s focus. Two countries could not be more different than Australia and India, one rich and industrialised, another rapidly industrialising but with high inequality. Australia with the world’s highest per capita emissions and India where the converse is true. Yet both are democracies and both rely on coal for energy. Needless to say, in two societies as disparate, the human and ecological impacts of coal-mining differ significantly. How do communities, if ever, win a struggle to stop coal-mining against powerful corporations and vested interests of governments in India? Against all odds! This is an account of one such rarely successful struggle from the heartland of coalmining, in Singrauli district of the Central India state of Madhya Pradesh. Ruchira Talukdar had the opportunity to visit the forested Mahan area in Singrauli with Greenpeace activists Priya Pillai and Akshay Gupta in April 2017. The time of her visit marked exactly two years since the controversial Mahan coalblock had been declared off limits for mining. It was a massive milestone for the Mahan Sangharsh Samiti (MSS); the Greenpeace facilitated local resistance, which had united people from the surrounding villages. Strengthened by its success, the movement was preparing to take on future challenges. It’s the 31st of March, and we are driving to Amelia village for a public meeting. As we approach, three little boys in oversized shirts run after our SUV shouting Zindabad, punching the air with their little fists. The Hindi word that literally means ‘long live’ is commonly used at political gatherings as a shout of encouragement. It is mid morning and the summer loo has already started blowing. We see dust blowing across the empty fields, and spot the billowing tent top, the setting for the day’s programme, in its midst. Late spring is peak Mahua gathering season for forest dependent communities in Central India. This yellow flower with a clammy fragrance, growing on spreading branches of the Mahua tree, is the economic, cultural and spiritual nerve centre for various indigenous communities in Central India. Every year during the Mahua season in early summer, forest-dependent families in these parts leave home to camp in the forests for weeks on end. They collect, dry and sell the yellow Mahua flowers, needed for various herbal and medicinal products. Priya is rightly anxious about the turnout. But her fears are allayed when the big top fills up with men, women and children numbering over 1,000 from the neighbouring villages fringing the Mahan forests. It is the second anniversary of the people’s victory over coalmining in the Mahan forests, commemorating a resistance that spanned four years and forged an unusual alliance between an international NGO and the eight forest-dependent villages of Amelia, Budher, Bandhora, Suhira, Barwatola, Nagwa, Khairahi and Karsua Lal. This year’s celebrations have been linked with global climate change events organised by the ‘Break Free from Fossil Fuels’ coalition. Inside the tent, the large banner framing the stage reads ‘Vishal Van Adhikar Sammelan’, meaning Forest Rights Meeting. The logo of the aandolan as the MSS resistance movement is referred to amongst the locals, is that of a dancing ring of people surrounding a circle of peacock feathers, with a Mahua tree at the centre in Warli tribal motif on a bright green background. Symbolising protection of the forest and its plants and animals by the community, the logo is conspicuous on badges worn by members, and on little triangular flags held by children. Greenpeace signage is conspicuously absent. Solidarity for forest and democratic rights is demonstrated both through the large turnout and the several speeches during the next four hours. Core members of the MSS speak about the need to stay united and continue the struggle. I put faces to names I already know through news stories, testimonials on the community radio channel Radio Sangharsh, and the MSS facebook page: Jagnarayan Shah, Hardayal Singh Gond, Kripanath Yadav, Bechanlal Shah and Ujraj Singh Khairwar from Amelia village. They greet me with a gusto-packed Zindabad. I also meet Anita Kushwaha from neighbouring Budher, who makes up the women’s face of the movement. Having only seen her on the cover of news reports, including a Chipko-movement-style, tree-hugging cover of Outlook magazine, I had imagined her as vocal and unfazed. But she turns out to be a soft-spoken young woman. She needs extra urging, compared to the men, to speak in public. The turnout of women at the public meeting is also lesser than usual, around one fourth that of the men. I am told that this is because many have set up camp in the forest to gather Mahua. The hot hours and litany of speeches are broken up with frequent sloganeering. ‘Jangal hamara apka hai, nahi kisi ka baap ka hai’, a reminder that the forests belong to the community, not the government or the company, is one of the most popular chants. This is not just a valedictory slogan to their recent success; it is an assertion of their fundaments rights to the Mahan forests under the Forest Rights Act 2006 (FRA). The Forest Rights Act was passed in 2006 to finally give forest-dwelling and forest-dependent indigenous communities their historic dues – individual and collective rights over their ancestral forest-lands. The legislation sought to right a historic wrong that went way back to India’s colonial era when British administrators began enclosing forest commons and levied taxes on communities for accessing their own lands. This landmark Act changed the way forest dependent communities looked at their rights. The success of the Dongriya Kondh people in stopping bauxite mining at the Niyamgiri hills in the eastern state of Odisha, through gram sabhas or village council resolutions that vetoed mining in 2013 caused a ripple effect. It inspired many other tribal communities to claim rights over forests they have relied on for generations. In a similar way, the FRA gave the nascent Mahan movement a legal shield against the destruction of forests, homes, and livelihoods. Greenpeace’s first mission in the area, therefore, was to build awareness about the community’s rights over forests. In the initial meetings organised in the various villages of Mahan, Priya and Akshay engaged the community in a dialogue to understand how they understood their ownership over the forests. Greenpeace also surveyed the community and reported on the findings about their material dependency on the forests. The discussion paper Countering Coal? showed the indispensability of the Mahan forests to the indigenous way of life. Apart from the commercial harvesting of Mahua flowers and Tendu leaves, the use and knowledge of various fruits, roots, herbs, wood, flowers ad leaves, leaves are captured in the survey. I come across a similar but more narrative account of the relevance of the Mahan forests to their way of life in Kripanath Yadav’s diary entry from 6th June 2014 titled, ‘What do I get from the forests’. Sitting with his musical accompaniment the Harmonium under the tent-top, he tells me that the idea of systematically documenting what the forests yield, based on all the knowledge that has been passed down over generations, occurred to him at a moment when he feared that the battle had been lost! As far as ownership of forests are concerned, Greenpeace found that the community variously believed the state, the forestry department, or even the forest guards for that matter owned the forests, Priya tells me. Ujraj Singh confirms this. Before they had heard about the FRA, they used to believe the Sarkar, as the state is commonly known in India, owned the forests and could take them away at will. The initial step of building the community’s trust was a challenge, Priya says. After two years of trying to mobilise the community in Amelia, the largest village adjoining the Mahan forests, Greenpeace was on the verge of giving up the attempt to generate a movement. Local company officials from Mahan Coal Ltd, a joint venture between Essar Power and Hindalco, however, felt sufficiently threatened by Greenpeace’s presence and resorted to foul play in an attempt to sabotage the organisation’s work. In one such attempt, a group of company agents and family members of the Sarpanch of Amelia, the village head, threatened Kripanath Yadav at gunpoint. He and some other locals were forcefully taken to Hindalco’s office in the district headquarters and asked to sign on to a letter containing baseless allegations against Greenpeace. Narrating the incident to me, Kripanath tells me that company officials admitted to being primarily concerned about driving activist Priya Pillai away. Kripanath narrates that they finally escaped the compound of the Hindalco property when an internal scuffle broke out between the Sarpanch’s family and the company agents over internal differences. This incident opened Kripanath’s eyes. After returning to Amelia he asked Greenpeace to come and work with his community, promising full cooperation from then onwards. Similar to Niyamgiri, based on the understanding of historic association with forests, the word adhikaar meaning ‘rights’ entered the movement lexicon and the chief weapon against the risk of mining at Mahan. Other banners inside the celebration tent, produced at various stages of the movement, speak to the centrality of legal rights to the MSS’s work: ‘Jan jan ka naara hai, van adhikaar hamara hai’ meaning the forest is our right and ‘gaon gaon ki yahi pukaar, le ke rahenge van adhikar’ meaning ‘there is a chorus rising from the villages – we will have our rights over our forests’ were the most conspicuous. Kripanath has put his musical creativity to the movement’s use. At today’s meeting he sings a self-composed number about the four-year-long struggle along with his local band. The audience breaks into a big round of applause when they sing about the shameful forgery of signatures by the local administration at the village council. The forgery at the Gram Sabha proved to be a turning point in the resistance, a juncture at which many others who had avoided joining the movement stepped in. On 6th March 2013, after a council meeting in Amelia that was attended by a small crowd of 184, the village head Santosh Singh along with the local administrative officer Vivek Gupta forged the signatures of 1084 villagers on to a statement approving mining in the forests. Two of the signatures were from deceased persons, and one was someone jailed at the time. The incident was brought to light only when Greenpeace filed a right to information petition. Jagnarayan, like many others, had learnt to live with the red-and-white-banded smoke stack and the fly ash from the Essar Thermal Power Plant, situated four kilometres from Amelia, since 2008. One of the few in his village to have passed a masters degree, he worked as a supervisor at the plant. He tells me that initially he felt cynical about big NGOs, like Greenpeace. ‘Ye log tikenge kya?’ he used to ask himself, wondering if they would stick around for long or leave after a brief intervention of some sort. The forgery proved to be the tipping point and made him realise the enormity of the threat. He shed his cynicism about the lasting power of big NGOs, quit his job, and devoted his energies to the movement. Kripanath Yadav, Bechanlal Shah and two other locals travelled to Delhi to meet the Tribal Affairs Minister K C Deo along with Greenpeace, after the forgery was confirmed through documents obtained through freedom of information (FOI). A fresh Gram Sabha was ordered to be held to determine the prevailing sentiment of community members in relation to the coalmine. People of Mahan have been intimate with the forests for generations. MSS member Ujraj Singh’s face creased up with countless smile lines recollecting childhood memories of having an orphaned lion that his father found in the forest for a pet. 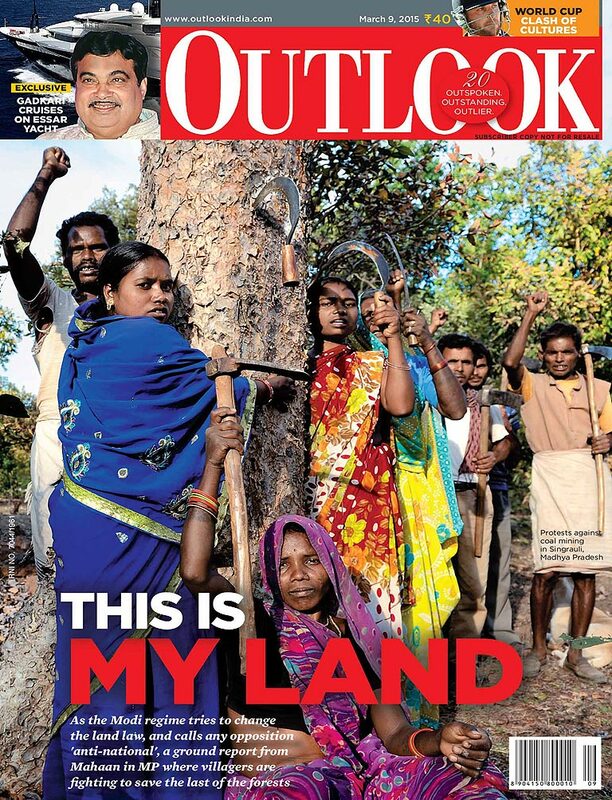 The assertion ‘Purkho ka naata nahi todenge, jangal zameen nahi chodenge’ meaning ‘we will respect our ancestral land, we will not give up our forests’ became a movement anthem. At the public meeting, in between the various speeches at the public meeting, groups of women get together to lead the crowd in singing it. But, apart from the obvious aspect of the resistance – a fight to protect the forests and their livelihood – there is another spirit about the movement at Mahan: a conscious act of dissent. Events unfolded in the later stages of the resistance, which made the MSS acutely aware of the implications of their act of stopping coalmining against the broader canvas of Indian politics. The story of the Mahan resistance shot to the centre of national consciousness with the offloading of Greenpeace activist Priya Pillai from a London bound flight from New Delhi in January 2015. She was scheduled to meet UK Parliamentarians and brief them about Essar Power’s activities in violation of laws, and its impacts on forest-dependent communities in Mahan. Greenpeace had already been ‘marked’ as anti-development, according to a report by the Intelligence Bureau of India, which said that certain foreign funded NGOs were taking down India’s development projects. A second Intelligence Bureau (IB) Report had gone further, specifically targeting Greenpeace and alleging that the organisation had used foreign funding to spearhead a “concerted campaign against India’s energy expansion plans” through its anti-coal activities; that the organisation planned to “take down” 40,000 mega watts of thermal projects. Both these reports had been leaked to the media in the first month of Narendra Modi assuming Indian Prime Ministership. Acting on these allegations, a newly elected Modi government had cracked down on several foreign funded NGOs in India; Greenpeace in particular had become a special target of the government’s institutional apparatus and its international funds were frozen. The Delhi High court judgement on the case of Priya’s offloading and the freezing of Greenpeace’s funds ruled in the NGO’s favour by declaring that ‘dissent is critical to a democracy’. Deliberating on the meaning and origin of the word anti-national, judge Rajiv Sakhdar’s judgement stated, “developmental activities have always had a counter point… there might be disparate views amongst persons who form a nation, including on matters of how the tradition and heritage of a country are taken forward. Contrarian views held by a group of people on these matters cannot make them anti-national”. The final ruling, read at the Delhi High Court on 12 March 2015, reaffirmed the function of civil society as an essential place for dissent in a democracy, at a time when the space for criticism is feared to be shrinking. For the local resistance to the Mahan coalblock, the ruling shone the spotlight on its story as an example of democracy in practice. One of the most frequently used banners of the Mahan Sangharsh Samiti, now hanging on the left side of the tent, painted in black on a yellow background, carries the slogan Loktantra Zindabad! Long Live Democracy! A blown up image of the local members of the movement holding the banner under a large Mahua tree also hangs in Greenpeace’s Delhi office. The photograph was taken two years back, at an event organised to celebrate the movement’s victory after the Modi-led NDA government’s decision to put the Mahan coal block off limits for mining. The 30th of March 2015 was commemorated as ‘Democracy Day’ along with other local and regional people’s rights based organisations. Since then, the Mahan resistance has broadened its horizons by associating with the National Association of People’s Movements (NAPM), a national umbrella group of several movements spread across India. MSS members also travelled to the state capital, Bhopal, for the 40th anniversary of the 1984 Union Carbide gas tragedy. Speaking on Radio Sangharsh after returning from Bhopal in December 2014, Kripanath appealed to his community not to allow any company without accountability to enter Mahan. Ultimately, such a multi-pronged story of the movement, enfolding and mutually reinforcing community rights over forests with rights of citizens to dissent, made an inclusive case for saving one of the oldest contiguous Sal forests in Asia at Mahan. This phenomenon points to the ability of Greenpeace in striking and sustaining a strong relationship with the local community. Willingness to trust an external organisation – particularly one that hasn’t been able to shed its “foreign” tag even after two decades of working in India – grew slowly and over time. Greenpeace set about the task of empowering the community in a step-by-step manner. Confidence in their methods and commitment amongst the people of Mahan also grew in direct response to the threat of mining. Once established, the relationship yielded an interesting alliance. Men and women from Mahan embracing Greenpeace’s signature ‘stunt actions’ stands out as one of the quirkiest aspects of the movement. Jagnarayan and Hardayal break into peels of laughter recollecting standing outside the Essar headquarters in Kurla, Mumbai, while Greenpeace climbers unfurled a giant 36 x 72 ft banner from the top of the building. The message ‘We kill forests: Essar’ unfurled directly above their heads at the front entrance to the building, and even as gathered photographers broke into a riot of clicking, 27 MSS members stood still, sticking strictly to their script in the action drama. Participating in this stunt took a massive leap of faith on the part of the village communities. None of the 27 MSS members had ever travelled to Mumbai, India’s financial capital, before the activity. Most of them had not even left the boundaries of their own state. For Anita Khuswaha, who left her little son and family behind in the village for days to travel to a big metropolis to challenge a mighty corporation, it was almost a surreal experience. But anger and frustration clearly kept her focussed. Instead of standing at the front entrance with the rest of her community, the reticent Anita Khuswaha was inside the main building when the banner was dropped. When asked by an Essar Human Resources staff member why she had illegally entered their building, she promptly turned the question back at the official, asking, ‘why does your company keep entering my village without our permission?’ In the MSS, she is well regarded for intimidating company agents who visit her village of Budher, attempting to win people over and thwart the resistance. Seventy-two people were detained overnight on 22nd January 2014 after the activity. Essar Power retaliated by slapping a defamation lawsuit of 500 crore Indian rupees, equivalent to USD $80 million on Greenpeace and MSS combined. Responding to the allegations, Greenpeace alleged that the company’s activities in Mahan were illegal, since it had failed to meet the 36 conditions of environmental approval for mining. Greenpeace further argued that the 500 crore suit was a strategic measure by the corporation to stifle public voices against environmental degradation. The trial continues, needing 17 out of the 27 MSS members to travel three to four times a year for hearings at the courts in Mumbai. When I talk to Jagnarayan about the action, he tells me that he would have loved to have a chance to participate in such Greenpeace ‘stunts’ in the future. He treated the challenge of travelling to Mumbai for hearings as par for course. On one of the many multi-day journeys in crowded public buses returning from Mumbai to Amelia, Jagnarayan encountered windmills for the first time. Asking co-passengers what they were and learning that they generated electricity from wind, he wondered why the government could not install windmills in Mahan instead of pushing coalmining. Greenpeace and the locals at Mahan have taken considerable risk, and as a consequence, have been jointly implicated in several legal charges together. At this point of time, there are five ongoing legal cases against Greenpeace and MSS combined. Greenpeace activist Akshay Gupta has been arrested thrice and charged twice on grounds such as obstructing government officials from doing their duty, and looting and robbery, while campaigning in Singruali. Two MSS members have also been arrested and detained in jail along with him. The arrests that came within three months of each other were clearly devised to deal a blow to the movement in one of the most critical stages of the resistance. The Mahan coalmine was granted Stage 2 Environmental Clearance by the United Progressive Alliance Environment Minister Verappan Moily. Clearance had been granted based on the forged signatures and consensus for mining from the March 2013 village council. The locals, a majority of them women, had spread themselves out in the forest in an attempt to prevent Mahan Coal Limited officials from marking trees from felling. Kripanath Yadav’s diary entry from this period mentions the community persisting with these blockades for up to five months. Anita describes to me the curious incidents that led to the arrests. Company workers left the forest at lunchtime, leaving behind all their equipment, and never returned. Community members deposited the equipment at the police station and went home, assuming the troubles for the day were over. At midnight, the police simultaneously arrested two locals from Amelia village, and two Greenpeace staff from the Singrauli district headquarters in the town of Waidhan. They were subsequently charged with looting company equipment. While the others were let out on bail the next day, Bechenlal Shah, a senior citizen from Amelia, was detained in jail for 28 days. MSS and Greenpeace responded to this clampdown in two ways: first by organising a protest demonstration by forming a human chain of the words “Essar Quit Mahan” and second by organising a rally of 800 people in protest against unfair detention. “We wanted to show them that we are not afraid and will not back down,” Priya tells me. Once a relationship of trust had built up between the community and Greenpeace, the company officials, and the local administration keen to serve their interests, were no longer able to turn the former against the latter. Run-ins with local authorities increased in the last years of the resistance. Encouraged by Greenpeace’s presence and support, the movement also brought their share of complaints against the Mahan Coal Limited’s illicit and intimidating tactics to the local police station at Mara, near Mahan. One of the beneficial side-effects of the cooperation between Greenpeace and locals in the resistance movement proved to be relocating the police station to a neutral location outside the company premises (it that used to be housed inside the Essar Thermal Power Plant compound, requiring visitors to sign in the Essar company register in order to visit). The Greenpeace-Mahan cooperation speaks to an unusual alliance building, given the mistrust of large global NGOs by grassroots groups in India. Greenpeace India had previously been perceived as beating a hasty retreat from grassroots issues, leaving communities vulnerable, making networks like the National Association of People’s Movements wary of trusting the international NGO. However, once the Mahan Sangharsh Samiti’s work gathered force, leaders such as Anurag Modi and Sunilbhai Kesla (now deceased) from Jan Sangharsh Morcha, a Madhya Pradesh based people’s movement, stepped forward to vouch for the importance of this campaign in Singrauli, Priya tells me. This indicates a shift in the way grassroots groups realise their relationship with large, global NGOs. In a highly commendable show of solidarity for Greenpeace India during one its most difficult periods, members of the Mahan Sangharsh Samiti spoke out against the freezing of the NGOs funds, and anti-national and anti-development allegations over the organisation’s activism, and the offloading of Priya Pillai from a London bound flight. A series of testimonials from MSS members on ‘Radio Sangharsh’ in 2015 speak about the need to preserve the space for dissent in a democracy. The cooperation between the people of Mahan and Greenpeace activists left an imprint in national affairs by adding a chorus of opposing voices to coalmining. It came at a time when qualifying India’s national interest squarely on the basis of high economic growth powered by thermal power had begun to be challenged on the basis of its social and environmental effects. It also strengthened the environmental argument for protecting Asia’s oldest Sal forests with people’s rights to determine the fate of the forests, and their concerns for protecting their livelihoods. But equally importantly, it made a big difference to the everyday experience of communities living in a place marked for development by powerful private corporate interests. The resourcefulness of the individuals at the helm of the MSS, both from the side of the community and Greenpeace as well as the institutional clout that comes with a large and global NGO had much to contribute to this achievement. I had heard accounts from both Greenpeace staff – Akshay and Priya – and local MSS members about regular police disruption of the movement’s activities at the behest of the company officials. The most common included intimidation and warnings not to organise meetings and gatherings. Arrests were common at the time of the most crucial periods of the resistance in 2014, when Stage 2 clearance had been granted to the Mahan coal mine on the basis of forged community consensus, and people flocked to the forests to stop trees from being marked for felling. I had also heard accounts of local officials from Mahan Coal attempting to disrupt the daily lives of MSS members by incentivising and intimidating them. As an example, before the controversial Gram Sabha in 2013, company officials had allegedly distributed chicken and alcohol, and saris for women as bribes. Priya recounted being accosted by a Mahan Coal official in Amelia, who boasted about being the biggest hooligan in the area, and asked her to stop mobilising the community. The daily interactions between MSS members and the local authorities that I witnessed over the next few days bore testimony to the pattern of disruption I had heard about. In the next few days after the public meeting, MSS members got busy organising a public hearing for April 4th. It would be Singrauli region’s first public hearing, for the purpose of redressing the grievances of community members displaced during the setting up of Essar’s Thermal Power Plant in 2008. People from the villages of Nagwah, Khairahi, Bandhora and Karsua Lal had been sitting on a dharna, an indefinite protest, demanding a resolution for their displacement grievances. It was decided that they would take the matter to an external panel that included the NAPM leader Prafulla Samantara, recipient of the Goldman Environmental Award later in the year, and Supreme Court and National Green Tribunal advocates from New Delhi. At the behest of Essar Power, the local administration resorted to desperate tactics to sabotage the event. Priya received a phone call from the local police station at 10pm the night before the event in which she was informed that they had issued a curfew order preventing public gatherings within a five-kilometre radius of the Essar Power Plant. The reason provided was anticipated risk to private property. This literally meant not being able to host the meeting in any of the surrounding affected villages, and risking a low turnout at the event given that many villagers would not travel that distance on foot on a hot day, and that too in the middle of the Mahua-gathering-season, to testify. In the meantime, police reached the scheduled venue for the meeting and forced community members to dismantle the tent-top set up for the event. The main organiser from Khairahi village was threatened with arrest. The event finally took place owing to the resourcefulness of the community, Priya’s tenacious capacity to argue with the administration through the language of civil rights, and the trusting rapport that had built up between both sides. To avoid being stopped en-route, the panel was taken in a convoy of cars to the alternate venue, decided merely eight hours before the start of the hearing, along a rarely travelled back-route. MSS members carried the tent material on foot under the cover of dark to avoid being detected, and set up the event-space before the crack of dawn. The panel heard a range of grievances of people affected by land displacement, and committed to preparing a comprehensive action report based on the hearing. Three weeks after the public hearing, three men and three women from Khairahi village who had been outspoken against displacement, with one of the women carrying an eight-month-old, were arrested and detained for a period of five days. The grounds provided for their arrests, similar to several previous arrests, were that they had obstructed public servants from doing their duty. The scenario that emerges from the ground reflects the strong sense of entitlement of the local administration and company officials in a mining region to coerce and intimidate people with impunity. It also points to the ham-handedness of the top decision makers in writing destinies of landscapes and regions as per their choosing. It points to a deeper level of collusion between the various levels of governance to seal the fate of communities residing in resource-cursed regions of India. The nature of this growth, widely accepted as indispensable, has never been inclusive. Mahan, a foregone conclusion or new possibility? Singrauli, India’s coal capital generates eleven per cent of the country’s coal-fired energy. However, a substantial portion of its own population lives without electricity. The people of this region have seen three distinct waves of displacement; the first related to the creation of the massive Rihand Reservoir in 1962, the second associated with the development of public sector thermal power plants and associated coalmining in the 1980s, and the third from the setting up of privately owned mega thermal power plants since 2006. Whatever ‘national interest’ these transformations have served has ironically not included the majority of Singrauli’s native dwellers. The region was carved out as a separate district in 2008 ostensibly to facilitating private coalmining and power generation. ‘Nangapur’ is a more fitting description of what Singrauli has indeed been transformed to, Jagnarayan tells me wryly, the pun being on Singapore, which is what Madhya Pradesh Chief Minister Shivraj Chauhan promised to transform the newly formed district into. The Hindi word Nanga means ‘naked’. Since redrawing the region’s geography, more than 15,000 acres of land has been acquired, causing more than 10,000 families to be displaced. This pattern of growth, where concentrated extraction and power generation in one region damaged it socially and environmentally while providing benefits to other regions, propelled India into the modern industrial age under India’s first Prime Minister Nehru’s vision of ‘greater common good for all ’. But the exacerbation of these patterns of accumulation on the one hand, and dispossession on the other during the neoliberal era of India’s economic growth and energy production in the last two decades, renders the Modism ‘sab ka saath sab ka vikas’, the catchy election promise by India’s current Prime Minister which literally means ‘inclusive development, hollow’. The reality of Singrauli, a region with one of the poorest air qualities – it’s laden with mercury, fly ash and particulate matter from the twin impacts of coal mining and burning – is a far cry from the vision of Switzerland that Jawaharlal Nehru likened it to before commissioning large dams which began the journey of resource-rich Singrauli’s environmental destruction and social upheaval. The region now supplies power to 16 states, although 50 per cent of its own population lives below the poverty line, and a comparable population without electricity. Dystopia, such as is evident in the rest of Singrauli’s landscape arrived at the doorstep of the Mahan community with the setting up of Essar Power’s Thermal Plant near the villages of Khairahi and Nagwa, causing displacements without due compensation or employment opportunities. The fly ash brought with it mosquitoes, and the constant hum from the power plants drowned out the sounds of the forests they have woven tales around for generations, including that of the tiger’s roar. The relevance of dissenting voices arising from environmentally ravaged regions such as Singrauli need to be fully understood. Bechenlal Shah’s family has been displaced by three successive waves of development, twice by the Rihand Reservoir, and then during the setting up of the publically owned National Thermal Power Corporation Plant in the nearby town of Shaktinagar. They finally settled in Amelia. Why can’t they dig coal out of the ground from the Minister’s bungalow in Delhi? Why my home and my forests, Bechenlal asks in deep exasperation. There is nowhere else to escape from this menace, he says. Unlike the remote Dongriya Kondh who fought Vedanta’s bauxite mine in their sacred Niyamgiri hills, people of Mahan already know what loss, displacement and pollution looked like. It feels like we are being strangled, Jagnarayan says. “People of Singrauli are still not free from the clutches of displacement.” Avoiding the same fate as those displaced in earlier waves is foremost on their minds. Even though communities in Singrauli have been disrupted by successive displacements, and the sense of vulnerability to the clutches of developmental projects is acute, the people of Mahan showed resilience in the face of pressure from corporations and governments. They have shown a comparable sense of community in opposing a coalmine in their backyard. They have used the same tools available under the Forest Rights Act 2006 – the Community Forest Rights (CFRs) – to unanimously decide to protect one of Asia’s oldest contiguous Sal forests. The transformation of ordinary village folks into an organised resistance against the state and corporation is a long, twisted, and not-always-pleasant story. It follows multiple plotlines. Threats and intimidations from the company on a regular basis strengthened their resolve, the forgery of signatures at the 2013 Gram Sabha broke the complacency of many locals and brought them to the fight. The hostility of local administration did not deter them from their struggle. The realisation of their legitimate rights over the forests, enshrined in the language of the FRA, powered their emotional engines. And, last but not least, the realisation of their role in upholding dissent in the present context of shrinking democratic spaces in India gave them a proud confidence in participating in social change. The chronology of the resistance movement also lends itself to interesting interpretations. It spanned the coal-scam-plagued last leg of Manmohan Singh’s United Progressive Alliance (UPA) government, and the first year of Narendra Modi’s authoritarian National Democratic Alliance (NDA) government, who made it their mission to shorten environmental clearance timeframes, clamp down on the work of NGOs by targeting their international funding, and threaten free speech and dissent. The sense of being exposed to the vagaries of vested-interest-affected national policy created a sense of helplessness for people on the ground. The Mahan coalblock, along with adjoining Chatrasal, was first listed as a no-go area for mining, owing to the quality of the Sal forests. The life of the coalmine, a meagre fifteen years, was not worth destroying over four lakhs or 400,000+ old trees. However, buckling under conflicting priorities of the UPA government, the Ministry of Environment and Forests ultimately cleared Mahan for mining in 2014. The Supreme Court’s order on the Coal-Gate scandal, as the coal-scam was popularly known, came to the community’s rescue by declaring the allocation of Mahan and 213 other coal blocks invalid. The sense of relief, when the newly elected Modi-government ultimately excluded Mahan from the auctioning and reallocation process for coalblocks, in respect for the outstanding environmental values of the forests, was stupendous. The celebratory singing, dancing and feasting continued through the night of 30th March 2015, the day the decision was made public. The festivities ended with an offering in the morning to Dih Baba, the community’s forest god atop the hill. Success has evidently brought a sense of empowerment and a confidence. And it’s opened up a whole new world through their alliance with a high profile activist group that is known for its combative style and edgy activism. “Loktantra Zindabad”, meaning ‘Long Live Democracy’ the most definitive slogan of the MSS. It marks a new coming together of the environmental demands of a professionalised, international NGO and people’s rights to protect their land and livelihoods. Some obvious questions emerge about the future of Mahan and its people. Will the Forest Rights Act, the very platform from which the movement arose, survive in its current form? Since the Mahan success, the Modi Government has diluted the FRA, and further dilution attempts are underfoot. Will a global environmental organisation continue to invest in grassroots people’s movements? Will members of the Mahan Sangharsh Samiti themselves manage to stay united in an environment of constant interference from local company officials through incentives and intimidation? The long arm of coal-led development has spared the old forests of Mahan and the people who depend on it for the time being. Time alone will tell what lasting difference the MSS has can make; whether it ends up as a mere blip in the displacement-worn-landscape of Singrauli, or grows and strengthens the voices of dissent from India’s coal capital. MSS members understand that there are likely to be more fights ahead. Jagnarayan tells me he is prepared to fight again. But at this point of time, there is something strongly reassuring about standing at the public meeting on March 31st in the midst of a 1000-odd community members. As the second anniversary celebrations of victory for Mahan draws to an end, people gravitate towards the centre of the tent, chanting ‘ladenge, jitenge’, ‘we will fight, we will win’, in a rising chorus. Outside the billowing tent, the loo blows unabated. And in the Mahan forest across the fields of Amelia village, the elegant Mahua trees keep dropping yellow carpets of flowers and fill the air with a thick fragrance.